An improperly installed drain hose is by far the most common defect that I find with dishwasher installations, but it’s also one of the easiest things to get right. In the photo below, which was featured as a Structure Tech Photo of the Day, there are several plumbing defects, two of which are related to the dishwasher drain. 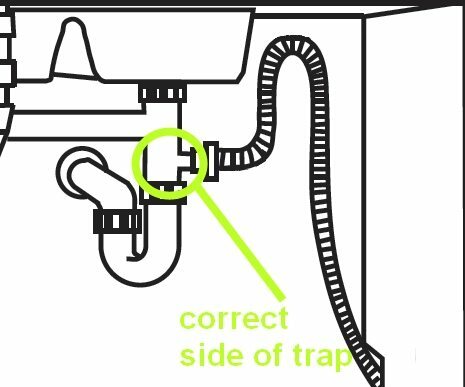 Problem number one is that the drain is connected to the sewer side of the trap. The water that always sits in the bottom of the P-trap is what prevents sewer gases from coming into the house. The dishwasher drain must be connected before the P-trap, not after it, which is what was done here. With this improper installation, sewer gases have the potential to come back into the dishwasher. The diagram below right shows a proper installation. In the diagram above, right, you’ll notice that the dishwasher drain makes a high loop underneath the kitchen sink. This is the minimum requirement for every dishwasher drain installation; it’s required by every manufacturer of dishwasher and it’s also required by the Minnesota State Plumbing Code (section 4715.1250). In fact, our plumbing code says “as high as possible under the countertop.” An alternative to installing a high loop is to install an air gap at the kitchen sink. This is a device that actually mounts above the sink. I can’t imagine why anyone would do this if they didn’t have to, however. How ugly. In some parts of the country, these air gaps are required no matter what. Too bad for them. Although new dishwashers come from the manufacturer with the drain looped up at the side of the dishwasher, every installation manual still requires this high loop underneath the sink. I’ve heard different reasons for why an additional loop is required under the sink, so I decided to contact the manufacturers directly. Bosch: The high loop in the drain hose of your dishwasher is to keep water from settling in the hose if it were hanging down any lower or horizontally. This keeps the drain hose dried out and keeps any odors from backing up into the dishwasher. Viking: In testing our dishwashers, we have found that the additional high loop in the back of the dishwasher is required for proper draining of the water. We have seen when this piece is not applied that over time the consumer will have issues with the water back up and causing issues with proper drainage and water pooling in a particular area. Maytag: No response after 29 days. Boo. Whirlpool: No response after 29 days. Boo. Amana: No response after 29 days. Boo. To summarize, the reasons for the high loop are to prevent potential backflow of water in to the dishwasher and to prevent improper drainage of water. Even though dishwashers come from the factory with the drain looped up high against the side of the dishwasher, this is not an acceptable substitute for the high loop underneath the kitchen sink. 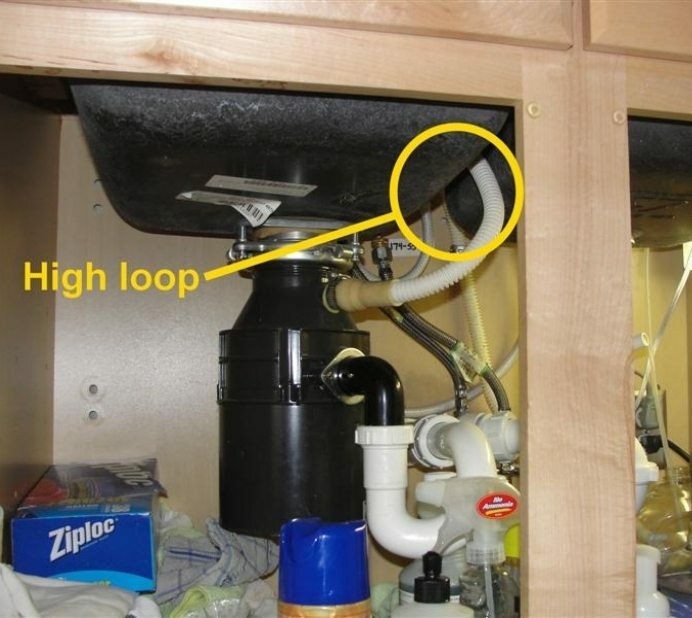 In Minneapolis, the lack of a properly installed high loop under the kitchen sink requires repair for their Truth-In-Sale of Housing evaluations. I have Kenmore Elite Stainless steel dishwasher. We paid top of the price since we thought it will be great machine. Unfortunately since beginning we have some mold that is collecting everywhere inside dishwasher. We tried everything. Special liquids, vinegar, we cleaned it troughly in and out. I checked our hoses. We got bad smell and mold. Is there anyone who knows how to help? IN old house we had old Kenmore machine and it was working fine. Never smell. This Kenmore Elite we operate last 3 years with lots of problems. Please help. @Rafal – I think you’re looking for an appliance repair web site / forum. My dw drain is connected to the air gap directly. It bothers me that the drain water comes into the sink. After I replaced my air gap the dw drained great but i hate it coming into the sink. If I change this which won’t be easy where do I put the air gap? @Mike S – I don’t know. 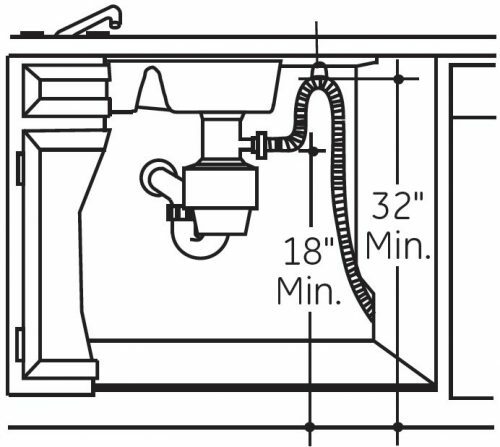 The is not sufficient (>14″) vertical space between the garbage disposal inlet from the dishwasher and the bottom of counter top. I plan to rig a check value at the inlet to the disposal. Any comments and any suggestion for a value brand or connectors. If you don’t think you need an air gap for back flow prevention and cross contamination, go drain that sink trap into a clear glass and drink it. Go ahead, I’ll wait. You are connecting your dishwasher to your sewer, even though it’s above the trap, the check valve in the dishwasher will not prevent cross contamination, unless it is specifically designed to do so, and if it is, it will require annual testing and certification. An air-gap device will eliminate the problem. Ugly? So what? Better than grunge in your dishwasher. I just installed a new dw and as soon as I finished I found black gunk in a shower I’m the basement and my washing machine. Any chance that it’s related to the new install or just a separate issue? @josh – probably a separate issue. I suddenly have a slow draining kitchen sink. The dishwasher backs up into it and sometimes when I run the disposal it backs up into the other side, It goes down but not like it used to. I did notice that my dishwasher drain line was just draped across under the sink and installed into the drain for the disposal free sink. (rental house) I took every pipe fitting I could apart and have snaked everything including the vent pipe outside on the roof. I am not finding much in the pipes. When I take the plug out of the bottom of the trap, water drains just fine from both sides of the sink. When I put it back and run water in the sink, it comes out into the dishwasher drain line and some comes out of the plug opening. It’s acting more like an air pressure problem than a clog, but I’m out of ideas of what to do next and I can’t afford a plumber. I doubt landlord would pay it. Thoughts please? @Kathryn – what you’re describing sounds like a clogged drain, which isn’t a problem with your dishwasher. Do you have old steel drain lines? How long of a snake did you run down the drain? I removed my dishwasher to install tile and when replacing it I did not coil the drain hose beneath the DW as the original installer did. Will a vertical loop in the slack drain line put excess pressure on the pump or increase the risk of backflow, or will the this be okay? Hi Damon, a vertical loop should be fine. I am planning to go through the floor, hook up to the main drain line running to the septic tank, and build my p-trap and standpipe behind the dishwasher. I am not planning to go through the roof with a vent for it. The standpipe for my clothes washer is the same way, only air is able to get in between the discharge hose and the standpipe. For the dishwasher, it doesn’t have the same hook end on the discharge hose, so I thought I would hook it up to the standpipe just like I would to the drain under a sink. Do you think I need to put some time of cap on the top of the standpipe (about 22 inches above the floor)? Or do you think I can just leave it open? This is why I was kinda wondering if it would be better to get an air gap and mount it somehow to the top of the standpipe. I want to do this right the first time. I’m certainly interested in an informed opinion. 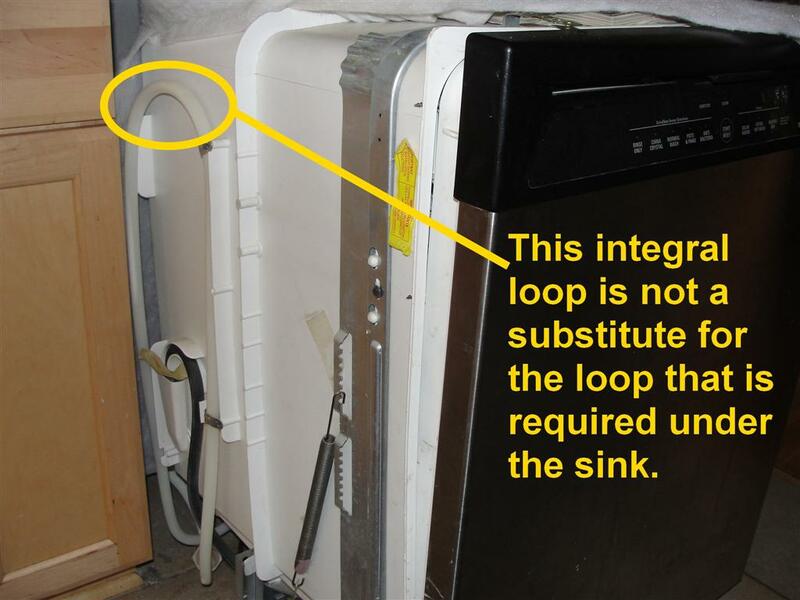 @Jimboep – I’ve seen dishwashers connected directly to standpipes without air gaps many times, but never lived in those houses to figure out if it caused a problem. I think my situation is similar to Ava’s. I am about to install a dishwasher that is not next to a sink. I am thinking I will put in a separate stand pipe with p-trap. 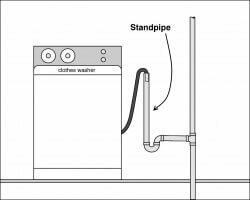 I’m not sure how to connect the drain line to the stand pipe, since it is different from the one for a washing machine. I would like to connect it on the side of the standpipe near the top, then cap off the top of the standpipe. But I’m afraid that if I do this, since there won’t be any way for air to get into the standpipe, this could create a siphon and draw water back into the DW. One of the Manufacturer responses mentioned putting and air gap on the stand pipe. Anyone know how to do this? Ava, it sounded like your problem may have been that there was no way for air to get into the left stand pipe. Does this make sense? What did you finally end up doing? Thanks Reuben! Dishwasher is now working great!! I’m installing a new dishwasher, and was wondering about best location for the drain line. The old installation had the drain line entering the top of the cabinet to go to the sink drain. But with the new dishwasher this pinches the drain line behind the machine. I am thinking of drilling a new hole at the bottom of the cabinet, where the dishwasher won’t pinch it, then I can do the high loop inside the sink cabinet. Does that work? Or should I just keep the original drain line hole? @Jonah – yes, your idea would work fine. That’s a common way of doing it. On occasion, when my garbage disposal has not been cleared, my dishwasher will leak water onto the floor and not drain properly. Clearing the disposal solves the problem and it then drains fine. My question is why does this happen? I would think that if the pump just couldn’t get rid of the water it would just sit in the bottom and the float valve would prevent the machine from moving on in the cycle or bringing in additional water? What am I not understanding here? Is this a design glitch and if not…is there something I can do to prevent this from happening b/c I sure my family will continue to forget to clear the disposal before running the dishwasher….thanks! @Joel – sorry, but you’d have to ask an appliance expert. After I close the door and hit start on my dishwasher, I don’t know what happens inside there. We had a garbage disposal installed 2 years ago by a professional tech it fell off sometime between Saturday and Sunday. We went to clean a pan when we got home Sunday letting the water run to get hot. Had water come flowing onto the floor and into the basement through the holes for the plumbing. We got that cleaned up but we feel that the company that installed the disposal should be responsible for the expense of reinstalling the disposal. I’ve never had a disposal just fall off. Just moved in to my new house and my BOSCH dishwasher smells. I read your blog and checked the installation of my dihwasher. It seems like my sink drain and dishwasher water disposal pipe apparently do not have a P-Trap and unlike most of the pictures online they are being drained towards the floor and not towards the wall. Wondering how should I address this issue. Ali K – I recommend you hire a plumber to take a look at your setup and correct it if necessary. Thank you, thank you, thank you soooo much!! I keep hearing it is user error for our dishwasher being backed up. Not after reading and looking, I can see it is the fault of the person whom installed it! We also had issue with the plastic pieces being found after it backed up the first time (of about a hundred times, lol). In above post, “Dishwasher had a terrible “STINK”, not “sink”” Oops! Reuben, I posted a comment on August 11 re: my stinky, un-usable Bosch DW & the hose loop issue. Several weeks since, the installer from the place that sold me the Bosch came by, but said I didn’t need a high loop since I had an air gap coming out the top of my sink. (And, my DW pump is working fine). He did admit that the DW had a terrible sink, however. I called Bosch about the smell. They said that if I don’t have a high loop, they can’t help me with the issue. Period. The hose currently runs from the dishwasher, along the cabinetry floor for 3′-4′, (it runs through another narrow cabinet before it gets inside of the area under my sink). It then runs up to the air gap and the side of my garbage disposal. The installer says it’s all hooked up correctly. Also – When the DW drained, I could easily see the water gushing into the disposal, so the hose is not blocked. (I’ve used both disposal & drain cleaner “just in case”, but never noticed a smell coming up into my sink – only in the dishwasher & my dishes there). I can, however, see some water sitting in the part of the hose that is running along the floor of the narrow cabinet next to the dishwasher. @Granny – an air gap is the best type of installation, and is required here in Minnesota on commercial installations. A high loop is allowed as an alternative in residential installations. If you have an air gap at your dishwasher, you definitely don’t need a high loop. Thanks for the quick response. I reread the Bosch DW Manuel and it instructs me to open the door all the way until I hear the water drain out (I heard it gurgle). Then I lifted the clear drain hose from the DW under my sink so the old water sitting in the hose could enter the garbage disposal yesterday and no smells yet! Living in the south I’m too familiar with the smell of mold and mildew. The smell was like an old dirty wet dish rag or sponge. I had sewer smells during construction before the plumber put in the pipes to the sewer system, and it wasn’t that smell! I wouldn’t be able to stay in the house. My nose or sense of smell is very sensitive. That said I’m still curious if there are alternate plumbing methods to fixture double sinks (1w/disposal) without a p trap? And, why would anyone design a DW so that dirty water sits in the drain hose until the next wash cycle of dirty water pushes the old cycle out? Thanks again! @Suz – good question. It should be quite simple to move the hose around a little so water never sits stagnant. I have new construction home with kit island and new Bosh DW which has the plastic hose loop coming through the top of the inside cabinet under the double sink – which sounds to be the correct loop. After that plastic drain line comes from the top it then falls to the floor of the cabinet then travels back around several more inches until it goes back up to enter the garbage disposal drain which is about 10″ from the cabinet floor. As you can imagine the hose is full of water. It seems too long and the bosh installation only says not to cut the hose. Which is what I thought should be done so water doesn’t sit in it. Which could be the cause of the moldy mildew smell? My problem has to do with a mildew smell coming from my kitchen sinks. I’ve tried everything to clean them and the garbage disposal to no avail. I don’t notice any smell from the dishwasher. there are one to two people using dishes and we always scrape and rinse dishes and don’t really use the garbage disposal. A home inspector told me (before i noticed the smell) there is no p trap and the plumbing would be difficult to get to for repairs with the lines going under the floor of the cabinet island. (Which is hopefully where a p trap may be?). I could send pics. I’m not sure if its the hose holding water and how to remedy if it can’t be shortened, or if its the plumbing connections without a visible p trap? Any questions or suggestions? Thanks for being our professional out there to help us solve these crazy issues! @Suz – if there is no trap underneath your sink, that’s definitely the source of your odor problem. It’s not mildew you’re smelling, but sewer gas. That’s a health hazard that you should have a plumber correct. Thanks for the great site – you MAY have solved my problem. However… My installer looped the drain hose behind the dishwasher, then the hose runs along the floor of my inside cabinet and straight up to my garbage disposal! The DW smells so bad that I had to stop using it several weeks ago. I had to soak all of my dishes in vinegar because the DW smell permeated them. On one of the last runs, the water in the dips at the top of my “clean” drinking glasses was a bit “milky” looking. Bosch just said “run it with vinegar”. I ran 3 loads with no dishes & vinegar, removed & cleaned the spray arms & filter, and washed down the stainless steel inside – and it still stinks. I’ve also used a cleaner on my disposal & my other sink drain, although there was no odor in either one. After all that, two weeks not being run at all, it still smells inside. An installer from the company from which I bought the DW 1 1/2 yrs ago is coming tomorrow – and I’m showing him YOUR article! By the way, Google “How to fix an odor from a dishwasher”, and you’ll get hundreds of hits – mostly by people with Bosch DWs. What gives? Interesting that of the manufacturers that responded, only Viking actually addressed the question – why two loops? And the reply from Bosch doesn’t even make sense: a dried-out hose keeping odors from backing up? As there’s agreement that the loops prevent backflow and siphoning, I can see 2 sources for that – water remaining in the drain hose and water flushed down the sink. A loop by the sink would keep water from the sink running down into the hose; a loop by the DW would keep the water in the hose flowing back to the DW. What do you think? I came upon this site trying to find a way to deal with a dishwasher that’s a long way from the drain (15′). No option to drain to a different location. Still looking for a creative solution. I purchased Kenmore Elite Dishwasher. It was top of the line model. Last 2 years mould is building up all over the place inside dishwasher. On the racks, walls etc. We tried to clean it with vinegar, bleach, expensive cleaners, baking soda etc. Nothing is working. Also there is some odor. What can cause this problem? Any solution? Please help. Hi Rafal, I recommend asking this question to the manufacturer or at a forum for appliance repairs. Reuben, first off great information on this topic Thanks!! Would it make a difference if I connect my drain hose into the drain pipe that runs across from 1 sink to the other? I’d still use the high loop and it’s before the p-trap as well, just not sure if there are any hazards to that ? MP – I think the dishwasher drain is supposed to be connected to a vertical pipe, not horizontal. I’ve seen horizontal connections done before and I’ve never made a big deal about it though. Is this something that I could do myself, or should I hire a plumber? It was something noted on my home inspection. @Pam – this is probably something you could do yourself. I just installed a Whirlpool DW and for the most part I think I followed all the directions. Before shoving the DW back into place and securing it in place with screws, I wanted to run it for a couple of minutes and then stop it and hit drain. Because part of the drain pipe is that white semi-transparent plastic, I could see that after the drain ended there was still some water in the drain pipe. It’s a new DW and the water used for this “test” was obviously clean. So I have 2 questions.. First, is there suppose to be water in the drain pipe after the DW is finished running a full cycle? And secondly, wouldn’t that water that gets trapped or left over in the drain pipe normally be dirty water? @Nigel – yes and yes. I recommend you contact someone who repairs appliances or try an appliance repair forum. We have had this smell coming from our dishwasher since we moved into our house 6 years ago. It was a new home construction. My wife has finally had enough and wants me to find a solution. The hose appears to be installed correctly and we do have an air gap. Do you have any ideas as to what might be the issue? Our dishes most often smell horribly. Thank you! Mike – do you have a Bosch? I’ve heard they’re super quiet because they don’t have a food grinder, so food needs to be manually removed. If that’s not it, I recommend you contact the manufacturer. Stupid mistake.. I forgot to mention I installed a new garbage disposal was well.. I forgot to remove the plastic plug to allow to high loop to drain into the disposal.. lol.. Rookie move..
Dishwasher was installed with an air gap. Purchased a new faucet that had a soap pump as part of the package. Removed air gap to make room for soap pump on the counter.. Installed high loop under counter top about 36in above floor level. Running from dishwasher to garbage disposal. Ever since I’ve done this my washer doesn’t drain fully. Any recommendations? High loop seems pretty straight forward. My work matches the illustrations in the above article. The company who installed my dishwasher did not put in a high loop. There is a lot of surplus drain hose between the dishwasher and the drain of the sink, and this surplus is coiled around like a big long snake under my kitchen sink. I just screwed the hose to the underside of my counter top which gets it as high as it can go but there is a lot of surplus hose…which side of the “high loop” should the surplus be on? 1. hose comes from dishwasher to high loop then dips down again toward the floor, then goes up again to the point where it enters the kitchen sink drain or 2. hose comes from dishwasher and coils around on the floor, then goes up to the high loop, then proceeds directly to point where it enters the kitchen sink drain? My dishwasher since installed has smelled bad after a wash (about 4 – 5 hours after it is done the wash a bad fishy smell comes about inside the dishwasher – a fairly new one: LG; LDF7932ST. I’m hoping this high loop thing will get rid of the smell. If I leave the dishes in there too long after a wash they take on the smell! I’ve never read any specs that specify where the slack should go, but the installation instructions always show the high loop immediately after the connection to the sink drain. That means the slack should go between the high loop and the dishwasher. Why the high loop requirement? In a vertical U shaped tube the water will settle to the same height on each side of the tube. Most dishwashers are physically lower than the sink it drains into. A cheap way to prevent water from draining from a higher to a lower level is the high loop that is AT LEAST as high as the sink rim. Therefore, IF THE SINK IS STOPPED UP the height of the water in the sink would be over the topmost position of the high loop and allow unwanted water back into the dishwasher. That is why the code makers have found out a high loop is a very inexpensive way prevent sink water back into the dishwasher. Water seeks it’s own level. Can I install dishwasher on opposite wall, run drain hose down through basement upper joist, and back up to sink? About a 10′ run from DW to sink. This way, would still be able to connect above p-trap at the sink. CJ – I’ve seen it done and it worked fine, but you should probably check the installation instructions for your dishwasher to make sure the manufacturer doesn’t have a limit on the drain length. Thanks for giving me your email address. I send you an email with pictures of the P-traps. Thanks again for any advice that you can provide. Hi there, managed to solve my problem, cheap and easy. First of all i had a dishwasher ans washing machine, on the other side of kitchen, away from the sink, with only one Stand up oultet pipe for drainage. So i could not put the washing machine, and dish/w, through same pipe. I could not get a trap to screw on, and the Guy in the Shop, told me they dont exist, i would have to swap hoses each time i done a wash. I thought this as nit right. So i went back to the same Shop. B and Q, and low and behold staring mme in the face was a (Self cutting Outlet Clamp) All i done was clamped the outlet trap to the pipe, with secure O ring, and cut therough the outlet with the cutting tool, that comes with this kit, just screws in. Put other hose on top of pipe trap, and Secure with Jubillee clip. Job done. I now have my washing machine, and dishwasher going through the same pipe, withoput having to cut another hole in the wall and add a new outlet, which i was advised. by somebody that said these tools do not exist. Yea right, saved myself over £170, and only took me half an hour. cost me £7 in total, thats about $4.50. Hope this helps anybody with same problem. PS, if anybody wants photos of it, will have to email me. Thank you for this wonderful (very informative) blog. I just purchased two KitchenAid dishwashers and had them installed a couple of weeks ago. One is on the right side of my double sink and one is on the left side of the sink. The dishwasher on the right drains into the disposal, but the dishwasher on the left drains into a P-trap. There was no dishwasher on the left side before and I am wondering if it was improperly installed because I noticed sewage/cloudy water backing up into the dishwasher when I wasn’t using it. Water collected and started leaking, and of course it has a horrible smell now. There is a very high loop for the drain, so I am not concerned about that. I am curious about the P-trap, because there are actually two P-traps. One P-trap is connected to the sink drain. The other P-trap is on the left side of the first P-trap. The high loop from the dishwasher drains into the top of the second P-trap, just like the piping from the sink drains into the top of the first P-trap. Both P-traps are connected to a Y shaped pipe that feeds into the sewer side of the trap. Does this make sense to you? Do you have any suggestions? I took some pictures, but is there any way for me to post them or email you? Although I should add that despite the installation instructions for my Bosch not specifying a high loop (see post above) after reading right through this thread I’m going to include one anyway. Not all dishwasher manufacturers installation instructions specify a high loop. For example the installation instructions for the Bosch SMS63M08AU. Click on download manual at http://www.bosch-home.co.nz/appliances/dishwashing/freestanding/SMS63M08AU.html then choose installation instructions from the list of documents. This is because modern Bosch dishwashers incorporate a backflow preventer. @Kevin – I looked all over that site, and the only downloads I could find were the sales manuals and user manuals; no installation manuals. Do you have a link for the installation manual? I’m willing to believe they don’t require the high loop, but this would be the first I’ve ever seen that didn’t require it, and I’d like to see the manual. I wouldn’t bother. The first cycle is just a rinse anyway. By the time the second cycle (wash cycle) starts the water will be hot anyway. I have just installed a new Frigidaire DW myself and all the information here and elsewhere about air gaps and high loops has given me greater confidience in the likelihood that my installation (with high loop) will be successful in ensuring long life and trouble free operation of my new DW! On an unrelated question, can anyone comment on the following? I have a problem with getting hot water to my dishwasher because I have to run the water nearly five minutes to get hot water which adds greatly to my water usage. Why is there no such adapter for to fit a dishwasher and a washing machine, into the same stand up drainpipe. I went to the shop, and was told they dont exist, only option i had was to make a new drain pipie, or swap hoses, which i do. I dont understand why. My dishwasher, and washer, are at the other side of the room from sink, as drainpipe is too. Could a misconfigured drain line cause bad odors? We have a new Bosh dishwasher and have noticed that if we have our back outside door open and then open the dishwasher a rotten odor is drawn from the dishwasher. Back door closed when the dishwasher is opened – no odor. Strange…. 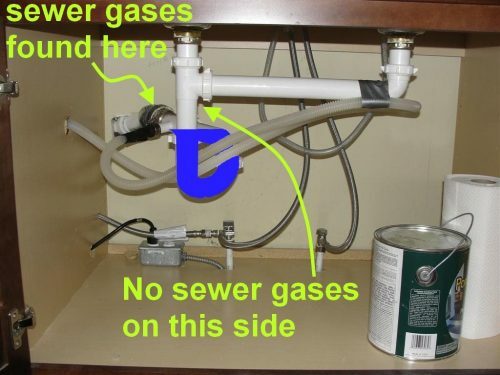 Jerry – yes, a drain connected to the sewer side of the trap could allow sewer gas to come in. Clyde – I’m not sure why your dishwasher isn’t draining completely. That would be a good question for an appliance repair person. Thanks, Reuben. 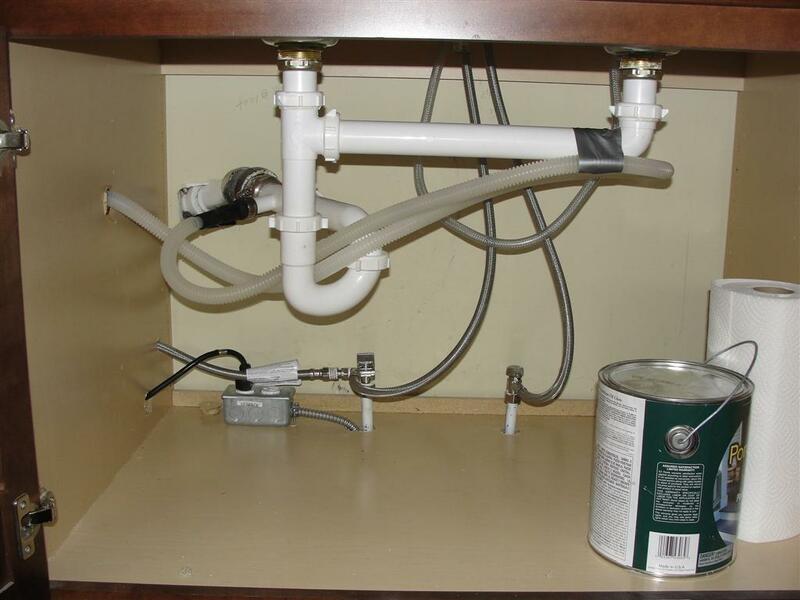 The drain hose is not connected to garbage disposal but to the sink drainage with a high loop. I have an old Bosh dishwasher. It was working very well until I renovated my kitchen. During a wash cycle, water started spewing out via the door and door opener. The mains fuse of the electric box tripped. I had to manually drain the dishwasher. I then shut the door but found it would not open again. Could the plumber have mucked it during connection? Advise would be appreciated. @Jollyferds – I’m sure it’s possible. If the drain hose connects to a garbage disposal, make sure the knockout hole in the side of your disposal has been ‘knocked out’. If it hasn’t, the water won’t have anywhere to go. Hi Jacki, it could be a bad pump or a clogged hose. I’m no appliance repair expert, but if it were me, I would start with the hose. Disconnect it and make sure water drains through it. Tom – yes, knock the piece of plastic out with a screwdriver and hammer. If you can, pull it out of the drain to reduce the risk of it getting lodged and leading to a clog. As long as you loop the drain high enough, you shouldn’t have to worry about water going back in to the dishwasher. Great writeup. I have a question regarding the suggested length of the drain line. I have a high loop as described however the drain line cmoing from the dishwasher has about 2 feet of slack that the installer coiled behind/underneath the dishwasher before going into the cabinet under the sink and then up to the high loop. The result is that water tends to pool in the slacked part of the drain line. This is usually not a problem however when we have a cold snap once in a while the drain line water freezes and the dishwasher won’t drain. The installer says this is induistry standard to have the slack in the drain line. Hi Robert, I agree with the installer. It’s standard practice to leave that slack in the line. If the water freezes, it’s an insulation problem. I have been installing for 24 years. 1st off yes you need the high loop. If the drain from the dishwasher is draining to a food waste disposer the loop up will prevent food from going down the drain hose. Kim your plastic problem could be the plastic plug that has to be knocked out before the drain hose was connected to the waste disposer, and left sitting in the disposer. And for the person who thinks plumbing his dishwasher directly to the basement will soon find that the dishwasher will syphon. You will get a first tub of water but not a second tub of water. As the first tub of water leaves the second wash water starts to enter the dishwasher and will follow the first wash water out causing a syphon effect. It will tell you in the instructions that you need to be at least as high as the dishwasher tub with the drain. About the plastic in the lines; I had this issue. The hotwater heater pipes disinigrated in the heater pumping pieces throughout the house clogging dishwasher faucets even the washing machine. I moved when the hot water in the tub was just a trickle. I got a new dishwasher and it didn’t have enough water pressure to rinse soap off. It was an apartment. Possibly this is the issue??? What you’re describing sounds like a water flow issue caused by old galvanized water pipes, which wouldn’t be related to the dishwasher. Andrew – the high loop should be right at the sink. This will help to prevent water from dumping back down the hose from the sink. Tim – wow, never heard of anything like that. I don’t have any idea why that would be happening. Hi, Does the location of the High Loop matter? Should it be beside the sink or can it be beside the dishwasher? I have an L-shaped layout, where is the dishwasher is in the other part of the L compared to the sink. The High Loop is right beside the dishwasher and then travels down to the sink around 6-8 feet away. Is this okay? Thanks for the all the information! Reuben, I followed all your steps, when installing my new dishwasher. The dishwasher drains into a loop and then down to the garbage disposal. I have a strage issue however. The sink now drains very slowly. If I disconnect the dishwasher drainage hose, everything works again. Try re-positioning the drain hose. It sounds like you’re stressing one of the connections. With that high loop issue I have water coming out of the top of the plastic piece that 2 hoses from dishwasher are connected to what do you sugest? Great info, I’m fixing my drain hose today. Thanks! I guess I should have followed the instruction sheet with the dishwasher. That’s what I get for not reading or believing the instructions!!! I do maintenance for a man who owns several rental properties, and they all have the very same issue – foul smelling dishwashers. They all have garbage disposals and none of them have the recommended high loop. sufficient to say, I will be rerouting all drain hoses. In that case, I’m completely stumped. Hi. My landlord recently installed a new dishwasher and a new garbage disposal after we found plastic parts (broken off From somewhere and something unknown). Now after I’ve used the dishwasher a couple of times since , I found d those same plastic parts in the garbage disposal. This time I heard the pieces so no apparent damage was done to the GD however, can/is it possible for the pipe/hole that drains the dishwasher into the disposal, could parts fall out from that piece into the disposal. I ask bC my landlord insists its human error however, I think there is something/a piece of something that is breaking off. Bit by bit coming either from the dishwasher and it ending up in the drain or from the pipe itself. Are there ridges to the pipe coming from the dishwasher that could be breaking off into the GD?? Help.!! I’m so frustrated w my landlord . Thanks in advance. I hate to say this, but before I was even done reading your story I was thinking to myself that this must be human error. Do you have kids? It’s highly unlikely that anything from the dishwasher or dishwasher drain hose is breaking off and ending up in your garbage disposer. I’ve never seen that happen… however, I have two little kids, and I’ve seen them put a lot of stuff where it doesn’t belong. Just bought my dishwasher and I’m thinking of doing the same as Glenn (posted July-10-2012) and Mike (posted Sept-10-2012) and draining through the 1st floor to my 2″ drainline hanging from the joists in the basement. Anyone know if big loop of the drain line connected to the side of the dishwasher acts as trap for sewer gases? Thanks very much for the information, but I have to second Glenn’s comment. I am also planning a through-the-floor drain, where a high loop would be difficult to install. While the manufacturers all say you need a high loop, there is little consistency in the reasons that they give. Kenmore and GE say its for backflow prevention, but running the drain to a standpipe as Glenn proposed prevents that danger better than a high loop does. Bosch says it’s there to keep water from settling in the drain hose. That makes no sense – a high loop will keep the drain hose filled with water upstream of its high point, and empty downstream of it. Viking says a high loop is needed to prevent “issues with proper drainage and water pooling in a particular area.” This information is ambiguous to the point of being effectively useless. The only thing I read that gives me pause is GE’s secondary reason of preventing water siphoning out during operation, but if the drain hose terminates at a level below the pump outlet, I don’t see how a high loop would prevent siphoning. If a high loop is so important, why don’t the manufacturers agree on the reason for it? @Mike – why don’t the manufacturers agree on the reason for the high loop? Good question. @JB – if you have your dishwasher draining in to a standpipe, the standpipe itself has a trap for sewer gases. I am plumbing my dishwasher drain directly through the floor and into a a stand-pipe upstream of the trap for the wahsing machine one floor below in the basement. No need for an additional high-loop. Glenn – according to every manufacturer’s installation instructions, there is a need for a high loop. Please read through the other comments. Great post and discussion. This answered all of my questions. Thanks to all! The purpose of the high loop is so that there is enough pressure due to water weight to close the check valve at the base of the drain pump. A low loop or a fouled check valve will allow whatever water is in the drain hose to drain back into the dishwasher. Potentially even sink water could bypass into the dishwasher under some circumstances. First off great article, really explains the issue. John, I wish your statement about all dishwashers coming with a check valve were true. There are dozens of blogs filled with people getting dirty water from their garbage disposal in theirdishwasher, myself included. I can’t speak for everyone else, but my hose has no high loop and I have dirty water in my Bosch dishwasher. Only thing to add is that this is more likely to occur when the either the drain or disposal unit is getting clogged, so cleaning it with an enzyme solution is recommended as well. It’s my understanding that all dishwasher pumps have a check valve at their discharge that will prevent back-flow. Please comment. I don’t know about the check valve. I’m sure it’s possible. I was excited to find this page. I need to to thank you for your time for this fantastic read!! I definitely really liked every part of it and I have you book marked to check out new information on your site. No, that’s not what the purpose of the high loop is. Can not having a high loop cause odors to come up thru the sink drain?